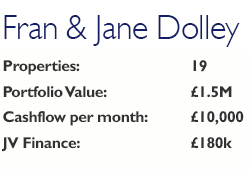 love the low money in cashflow strategy… really is infinite return on investment! well done on all that net cash flow pcm :) poor old peter and his nickname its beginning to stick lol! Just goes to show, the rewards for thinking outside the box. Fantastic. Great results and very inspiring, but the question is – who really wears the trousers?! Awesome, really inspirational! I love that you saw what you wanted, i.e. making through property, and just going out there and doing it! Amazing cashflow well done guys! Awesome work guys, it’s even more motivating to realise that your property investment success with Progressive Property has created careers for both your son and daughter… Looking forward to the next Multi-Let Without The Sweat masterclass!